The vast oceans of the world are full of peril and doom. The beasts of the dark depths are fearsome indeed- dread Leviathans, hulking Kraken and monstrous Serpents all feature prominently in the mythology and legends of the seas. One legend is feared above all others and only talked about in hushed whispers - the terrifying Crabmen. Crabmen are so greatly feared because they rise from the waves on dark nights and travel up to several miles inland to attack villages and farms along the coast. 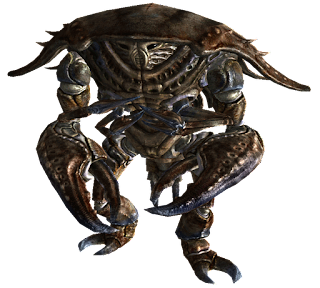 Crabmen are hulking ogre sized monstrosities which are covered in spikes and thick black shells, they are impervious to pain and have no concept of fear. 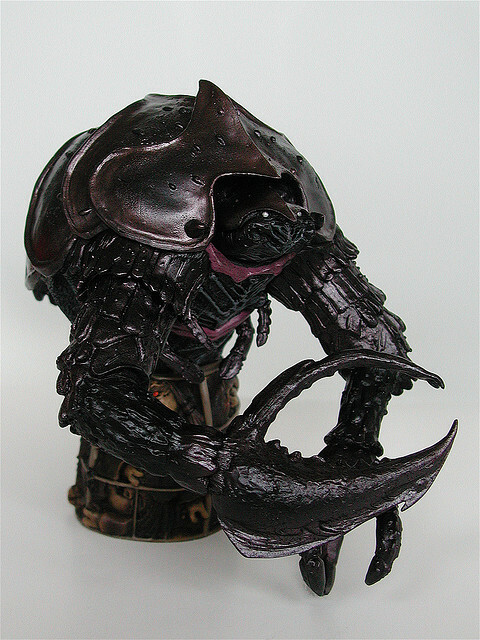 Crabmen use no tools or weapons- their claws can easily rend an armored knight apart in a single swipe. 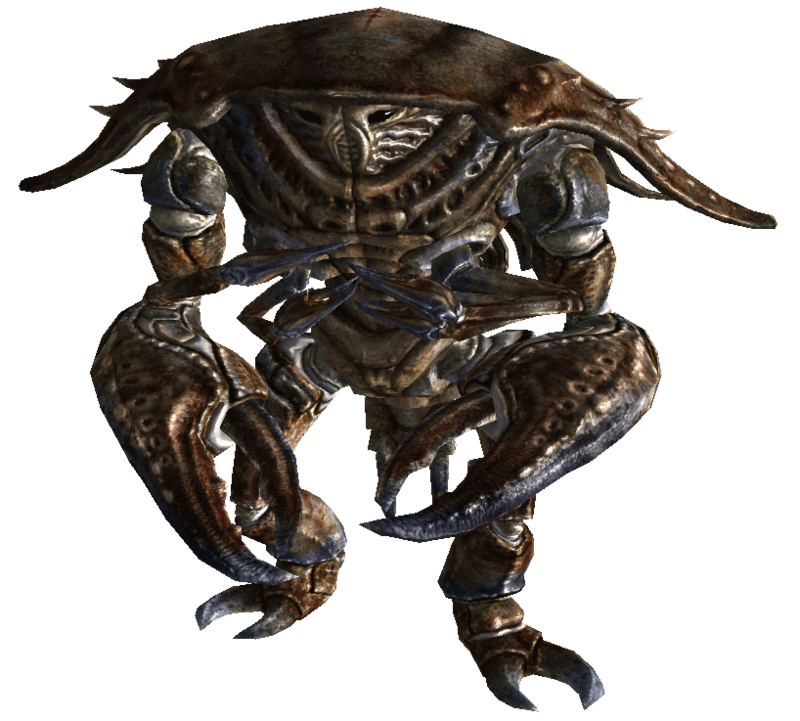 When Crabmen attack they do so with surprising speed and stealth- although they are quite large their scuttling gait is swift and silent. Although they are known to have a clicking speech they rarely talk amongst themselves and never do so during a raid, instead instinctively acting with supreme co-ordination in battle. Very few survivors live to report Crabmen attacks, raids are usually on defenseless villages and they will greatly outnumber their victims. Several dozen Crabmen will attack isolated farmsteads and several hundred will attack small villages. One of the most frightening aspects of a Crabman raid is that they seek out live prisoners and little else- leaving behind both livestock and valuables. Merfolk say that the Crabmen have been a threat to their communities since the dawn of civilization. Through the ages Merfolk have been fighting a constant war against the genocidal Crabmen and Merfolk blame Crabmen for the decline of their species. Attacks by Crabmen on humans are unprovoked, brutal, and thankfully rare. Sages believe that Crabmen raids are slowly but surely increasing in both frequency and boldness. 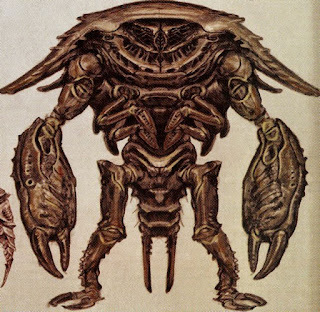 Some sages claim that Crabmen are pawns of an insidious evil race and are merely the vanguard troops of a much greater threat to humanity. Cool version of the Crabmen! Good backstory. Those are cool looking. Nice, really great take on a classic monster. Hey guys, thanks! And thank you Trey, your recent post on the South Seas reminded me how much I like Crabmen.